Were there any Aussies at the Battle of Jutland on 31st May 1916? There should have been a battle cruiser’s crew of Aussies. HMAS Australia was part of Second Battle Cruiser Squadron based at Rosyth. Unfortunately on 24th April 1917 HMAS Australia was in collision in dense fog with HMS New Zealand in much the same area as the Battle of Jutland was to take place a month later, putting Australia in ‘dockyard hands’ for two months. 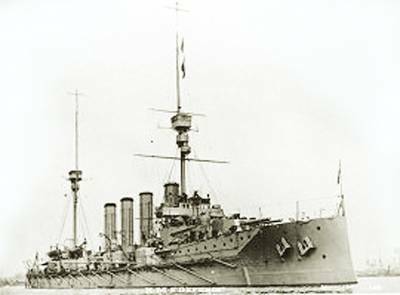 There were however three Australians on the armoured cruiser HMS Defence, the flag ship of First Cruiser Squadron; Sub Lieutenant George Paterson, RAN, Midshipman Joseph Mack, RAN and Stoker 2nd Class Mortimer Froude. The German naval authorities refused to include armoured cruisers in the High Seas Fleet line of battle on the basis that they were insufficiently gunned and armoured. Jutland showed how right they were. From Rear-Admiral Sir Robert Arbuthnot’s First Cruiser Squadron three of the four ships were sunk at Jutland: the flagship HMS Defence, HMS Warrior and HMS Black Prince, with few survivors. All three Aussies on HMS Defence were lost. In addition a Roman Catholic Padre Patrick Gibbons was attached to HMS Indomitable for the battle and Gunner (Warrant Officer) John Gill served on the battleship HMS Benbow, flagship of Vice-Admiral Sir Doveton Sturdee’s Fourth Battle Squadron. Both survived. HMS New Zealand fought in the thick of the Jutland battle being part of Vice-Admiral Sir David Beatty’s Battle Cruiser Fleet. She was a British ship donated by the New Zealand Government. On a pre-war visit to the Dominion a Maori chief presented a Maori kilt to the ship with the direction that the captain wear it whenever the ship was in action. The ship’s crew insisted that the captain complied with this requirement. Whenever the ship went into action a member of the crew would look onto the bridge to confirm that the captain was suitably clad so he could reassure the rest of the crew. 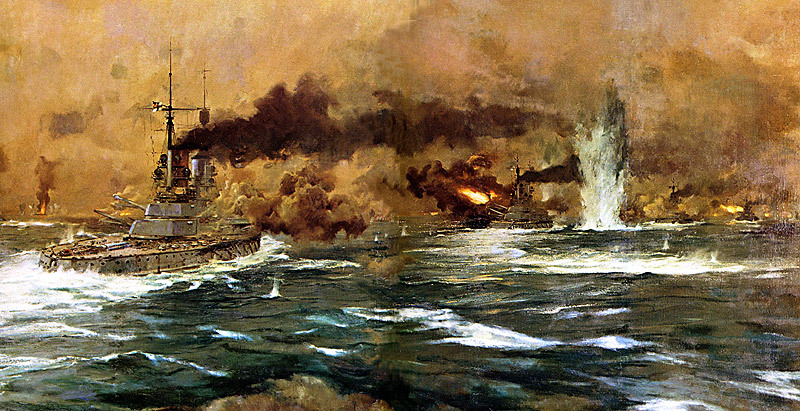 Picture of the Battle of Jutland by the German Wartime Marine Artist Claus Bergen. The ships in the foreground are German capital ships. To the left of the picture in the distance HMS Defence can be seen exploding after being repeatedly struck by large calibre German shells. Information on the Australian personnel from Naval Historical Society of Australia website.